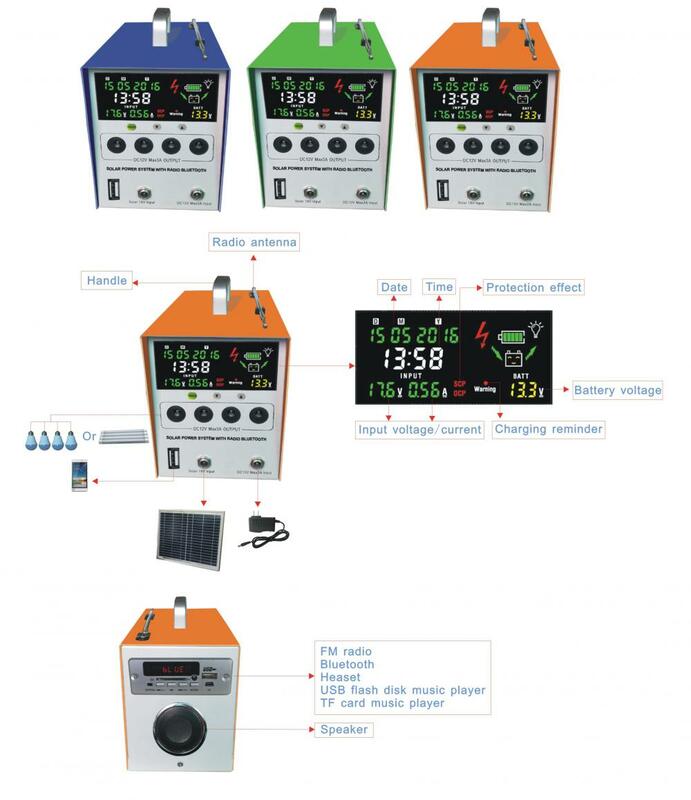 Product categories of Solar Lighting System with LCD Screen, we are specialized manufacturers from China, Lcd Solar Lighting kits, Lcd Solar Light Kits suppliers/factory, wholesale high-quality products of Lcd Outdoor Lighting R & D and manufacturing, we have the perfect after-sales service and technical support. Look forward to your cooperation! Solar Energy Powered Light/Solar Power Lamp is specially designed for the areas where are full of sunshine or lack of electricity ,using solar energy to produce electricity,and with mobile charger, LCD display ,FM radio ,Bluetooth,Speaker etc . What we can see from LCD screen? Date,time ,the current charging voltage,the status of batttery power,battery voltage ,charging reminder ,short circuit protection warning,Over current protection warning. How can we use mobile charger ? We will provide a USB cable for charging mobile phones ,MP3,MP4,digital camera etc . How can we operate FM radio ? Press the buttons or use the remote controller . How can we operate Bluetooth ? Connect your cellphone via Bluetooth ,and play musics on your cellphones ,then musics will be played via speaker .